When people are discussing eighteenth-century gown styles, the fourreau does not rank alongside the polonaise and turque; in fact, it never seems to come up at all. 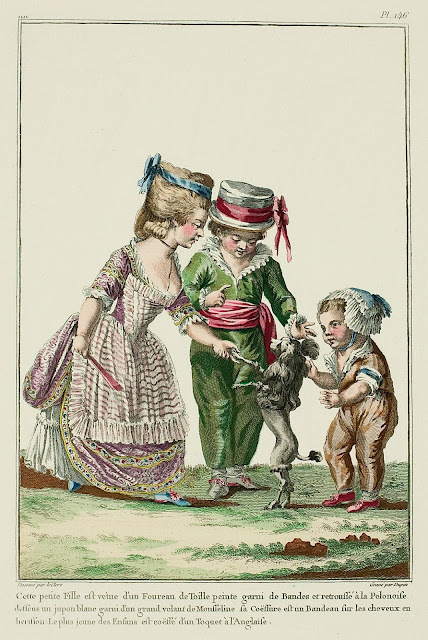 The fourreau depicted on children in Galerie des Modes is the typical children's gown of the eighteenth century: back-closing, but otherwise very similar to women's gowns. The fashion plates show that these fourreaux could be made à l'anglaise, worn retroussée à la polonaise - echoing fashions in gowns. This sort of echoing existed in the adult woman's fourreau as well. The Cabinet des Modes reported that "gowns and fourreaux à l'Anglaise, à la Turque, à la Janseniste, à la Circassienne, are still in fashion. 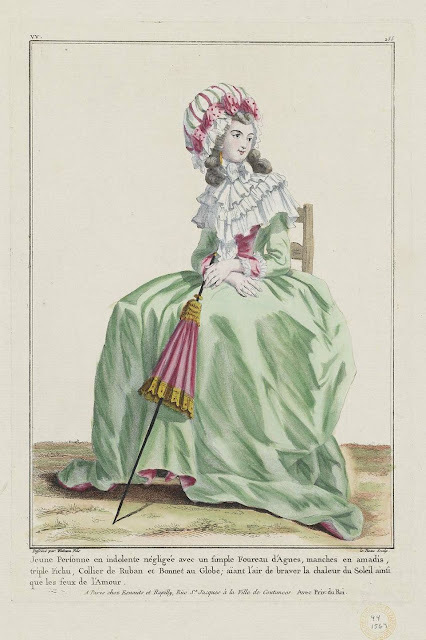 When a Lady is in a green fourreau, à la levite ..."
The adult version of the fourreau appears in the fashion plates in 1784, around the same time as the chemise gown, and the plates seem to show that - like the child's fourreau and the chemise - it has a closed skirt. The fourreau could be full or fitted, but in either case it looks to have not just been a "round gown" with a closed skirt, but a back-closing garment like the one worn by children. There is no back view in a fashion plate to examine, but it seems most likely that it would fasten with hooks and eyes or pins, rather than lacing. So far, I haven't been able to determine how late the fourreaux were worn - 1790 is the latest I've come across the term at the moment - but they seem to be generally part of the pre-Neoclassical Anglomania period. To my knowledge, there are no extant fourreaux in collections online, which would suggest that they were less common outside of the pages of fashion magazines. However, many portraits of the 1790s show very plain gowns that could possibly be fourreaux.